The Magdalenian (also Madelenian; French: Magdalénien) cultures are later cultures of the Upper Paleolithic in western Europe, dating from around 17,000 to 12,000 years ago. [is this date calibrated?] It is named after the type site of La Madeleine, a rock shelter located in the Vézère valley, commune of Tursac, in the Dordogne department of France. Originally termed L'âge du renne (the Age of the Reindeer) by Édouard Lartet and Henry Christy, the first systematic excavators of the type site, in their publication of 1875, the Magdalenian is synonymous in many people's minds with reindeer hunters, although Magdalenian sites also contain extensive evidence for the hunting of red deer, horses, and other large mammals present in Europe toward the end of the last ice age. The culture was geographically widespread, and later Magdalenian sites have been found from Portugal in the west to Poland in the east. It is the third epoch of Gabriel de Mortillet's cave chronology system, corresponding roughly to the Late Pleistocene. The Magdalenian epoch was a long one, represented by numerous stations, whose contents show progress in the arts and general culture. It was characterized by a cold and dry climate, the existence of humans in association with the reindeer, and the extinction of the mammoth. The use of bone and ivory for various implements, already begun in the preceding Solutrian epoch, was much increased, and the period is essentially a bone period. 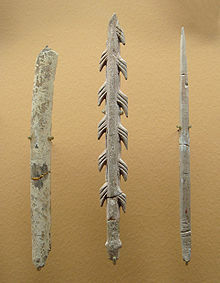 The bone instruments are quite varied: spear-points, harpoon-heads, borers, hooks, and needles. Most remarkable is the evidence La Madeleine affords of prehistoric art. Numbers of bones, reindeer antlers, and animal teeth were found, with crude pictures carved or etched on them of seals, fishes, reindeer, mammoths, and other creatures. The best of these are a mammoth engraved on a fragment of its own ivory;[dubious – discuss] a dagger of reindeer antler, with a handle in form of a reindeer; a cave-bear cut on a flat piece of schist; a seal on a bear's tooth; a fish drawn on a reindeer antler; and a complete picture, also on reindeer antler, showing horses, an aurochs, trees, and a snake biting a man's leg. The man is naked, which, together with the snake, suggests a warm climate in spite of the presence of the reindeer. The fauna of the Magdelenian epoch seems, indeed, to have included tigers and other tropical species side by side with reindeer, blue foxes, Arctic hares, and other polar creatures. Magdelenian humans appear to have been of low stature, dolichocephalic, with a low retreating forehead and prominent brow ridges. The culture spans from approximately 17,000 to 12,000 BP,[is this date calibrated?] toward the end of the last ice age. The Magdalenian tool culture is characterised by regular blade industries struck from carinated cores. Typologically, the Magdalenian is divided into six phases which are generally agreed to have chronological significance. The earliest phases are recognised by the varying proportion of blades and specific varieties of scrapers, the middle phases marked by the emergence of a microlithic component (particularly the distinctive denticulated microliths), and the later phases by the presence of uniserial (phase 5) and biserial 'harpoons' (phase 6) made of bone, antler, and ivory. There is extensive debate about the precise nature of the earliest Magdalenian assemblages, and it remains questionable whether the Badegoulian culture is, in fact, the earliest phase of the Magdalenian. Similarly, finds from the forest of Beauregard near Paris often have been suggested as belonging to the earliest Magdalenian. The earliest Magdalenian sites are all found in France. The Epigravettian is a similar culture appearing at the same time. Its known range extends from southeast France to the western shores of the Volga River, Russia, with a large number of sites in Italy. The later phases of the Magdalenian are also synonymous with the human re-settlement of north-western Europe after the Last Glacial Maximum during the Late Glacial Maximum. Research in Switzerland, southern Germany, and Belgium  has provided AMS radiocarbon dating to support this. Being hunter gatherers, Magdalenians did not simply re-settle permanently in north-west Europe, however, as they often followed herds and moved depending on seasons. By the end of the Magdalenian, the lithic technology shows a pronounced trend toward increased microlithisation. The bone harpoons and points have the most distinctive chronological markers within the typological sequence. As well as flint tools, the Magdalenians are best known for their elaborate worked bone, antler, and ivory that served both functional and aesthetic purposes, including perforated batons. Examples of Magdalenian portable art include batons, figurines, and intricately engraved projectile points, as well as items of personal adornment including sea shells, perforated carnivore teeth (presumably necklaces), and fossils. The sea shells and fossils found in Magdalenian sites may be sourced to relatively precise areas of origin, and so have been used to support hypothesis of Magdalenian hunter-gatherer seasonal ranges, and perhaps trade routes. Cave sites such as the world-famous Lascaux contain the best known examples of Magdalenian cave art. The site of Altamira in Spain, with its extensive and varied forms of Magdalenian mobiliary art has been suggested to be an agglomeration site where many small groups of Magdalenian hunter-gatherers congregated. In northern Spain and south-west France this tool culture was superseded by the Azilian culture. In northern Europe it was followed by different variants of the Tjongerian techno-complex. It has been suggested that key Late-glacial sites in south-western Britain also may be attributed to the Magdalenian, including the famous site of Kent's Cavern, although this remains open to debate. Besides La Madeleine, the chief stations of the epoch are Les Eyzies, Laugerie-Basse, and Gorges d'Enfer in the Dordogne; Grotte du Placard in Charente and others in south-west France. ^ a b Dates given vary somewhat: , , Britannica. This article incorporates text from a publication now in the public domain: Chisholm, Hugh, ed. (1911). "Madelenian" . Encyclopædia Britannica. 17 (11th ed.). Cambridge University Press. pp. 283–284. Charles, R. (1996): Back into the North: the Radiocarbon evidence for the Human Recolonisation of the North Western Ardennes after the Last Glacial Maximum. Proceedings of the Prehistoric Society 62: 1-17. Conkey, M.J. (1980): The identification of prehistoric hunter-gatherer aggregation sites: the case of Altimira. Current Anthropology 21: 609-630. Hemingway, M.F. (1980): The Initial Magdalenian in France. British Archaeological Reports International Series 90. 2 Vols. Housley, R.A, Gamble, C.S., Street, M. & Pettit, P. (1997): Radiocarbon Evidence for the Lateglacial Human Recolonisation of Northern Europe. Proceedings of the Prehistoric Society 63. Lartet, E & Christy, H. (1875): Reliquae Aquitanicae: being contributions to the archaeology of Périgord and adjoining provinces of Southern France. Williams & Norgate. London. Sonneville-Bordes, D. de & Perrot J. (1954–1956): Lexique typologique du Paléolithique supérieur. Bulletin de la Société Préhistorique Française 51: 327-335, 52: 76-79, 53: 408-412, 53: 547-549. Straus, Lawrence Guy (1992) : Iberia Before the Iberians. University of New Mexico Press. Wikimedia Commons has media related to Magdalenian.